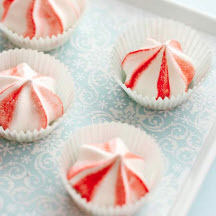 Who needs candy canes when you have these striped melt-in-your-mouth meringue treats? Serve these cookies as a snack or dessert at your next party. Preheat oven to 200°F (93.3°C). Line a cookie sheet with parchment paper; set aside. In a large bowl combine egg whites, cream of tartar, peppermint extract, and salt. Beat with an electric mixer on medium speed until soft peaks form (tips curl). Gradually add sugar, about 1 tablespoon at a time, beating on high speed until stiff peaks form (tips stand straight). With a clean small paintbrush, brush stripes of red paste food coloring on the inside of a pastry bag fitted with a 1/2-inch open-star tip. Carefully transfer egg white mixture to the pastry bag. Pipe 2-inch stars 1 inch apart onto prepared cookie sheet. Bake for 1 1/2 hours or until meringues appear dry and are firm when lightly touched. Transfer cookies to a wire rack; let cool. Nutritional Information Per Serving (1/24 of recipe): 27 kcal cal., 0g fat (0g sat. fat, 0g polyunsaturated fat, 0g monounsatured fat), 0mg chol., 20mg sodium, 6g carb., 0g fiber, 6g sugar, 0g protein.